The aim of these crosswalk designs is threefold. (1) improve pedestrian safety; (2) traffic calming device; (3) enhance the urban environment. These crosswalk designs comply with guidelines provided by NSW Roads and Maritime Services regarding pedestrian crossings. Specifically, white stripe width of 0.6, each stripe separated by 0.6, and crossing to be 3.6m wide. Specific guidelines available here. 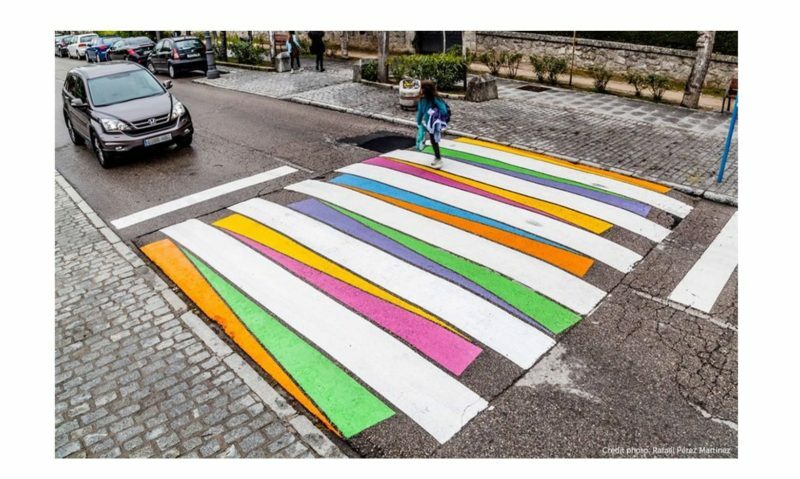 An online exhibition of Crosswalk Designs has been created to gather feedback in respect to a range of crosswalk designs. The designs have been exhibited on Instagram, LinkedIn and Twitter. Top rated crosswalk designs will be proposed to Sydney Council and North Sydney Council for consideration for future implementation. This evidence-based initiative involves combining specific colour contrast combinations that will that attract attention. White stripes will be painted with Resene FX Nightlight, a waterborne glow-in-the-dark paint alongside saturated Resene Lumbersider colours. Dynamic, diagonal patterns and colour juxtapositions that convey a sense of movement add to the effectiveness of these crosswalk designs. These measures are incorporated to improve environmental visual literacy for pedestrians and motorists. Urban supergraphics | Crosswalk designs – Why are they effective? Human visual perception involves saccades, scanning movements that eye makes on a continuous basis during normal vision. Strong contrast and movement attract the attention of saccades through either direct or peripheral vision. Strong contrast can occur across three dimensions: contrast of hue, contrast of light-dark tonal value and contrast of saturation-achromatic hues. Disruptive Colour harnesses colour/contrast to attract attention and encourage engagement and in doing so, enhances environmental visual literacy for pedestrians. Environmental visual literacy is an approach to design that harnesses the mechanics of human visual perception to improve product design and design of the built environment to ensure that key details are quickly and easily perceived and understood. 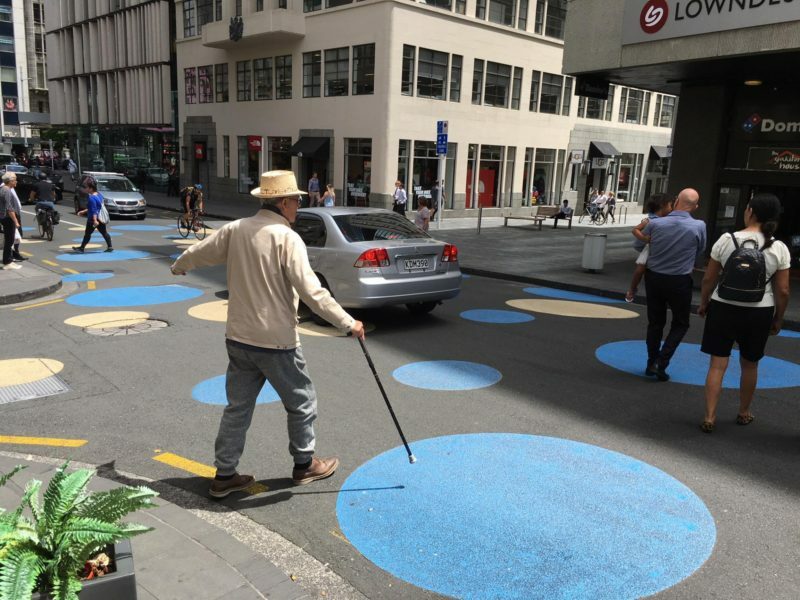 Auckland Design Office general manager Ludo Campbell-Reid initiated the dots on Shortland Street as a traffic calming measure, installed due to safety concerns raised by the Waitematā Local Board. The Design Office is part of Aucland Council and the year-long trial is a first for Auckland following similar international examples and the project budget, which covers coloured spots “sensitive to the heritage context” of the area, is $25,000. The area around the Lincoln/Wellington/Southport intersection on Chicago’s North Side has been transformed with a traffic calming and placemaking project. Blue and green dots link sidewalks and curb extensions (neckdowns) have been installed as a means of visually identifying pedestrian areas and calming traffic. 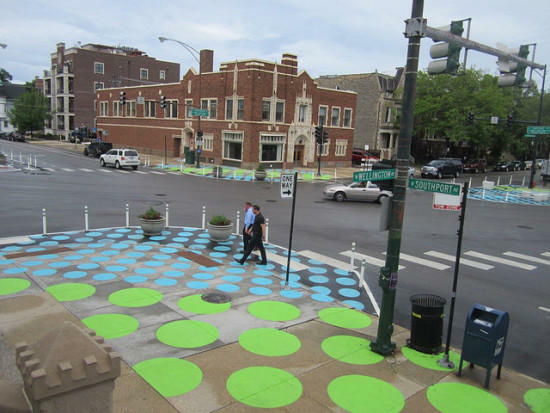 The dots have a three-year lifespan and will be replaced with a more permanent streetscape intervention. Visual media and conceptual artist Christo Guelov has created colourful, alternative pedestrian crossings in Madrid. The highly colourful pedestrian crossings not only add visual interest and variety in the urban environment but more importantly attract the attention of both pedestrians and drivers at crossing points. To find out more about Christo Guelov’s project, go to his website. 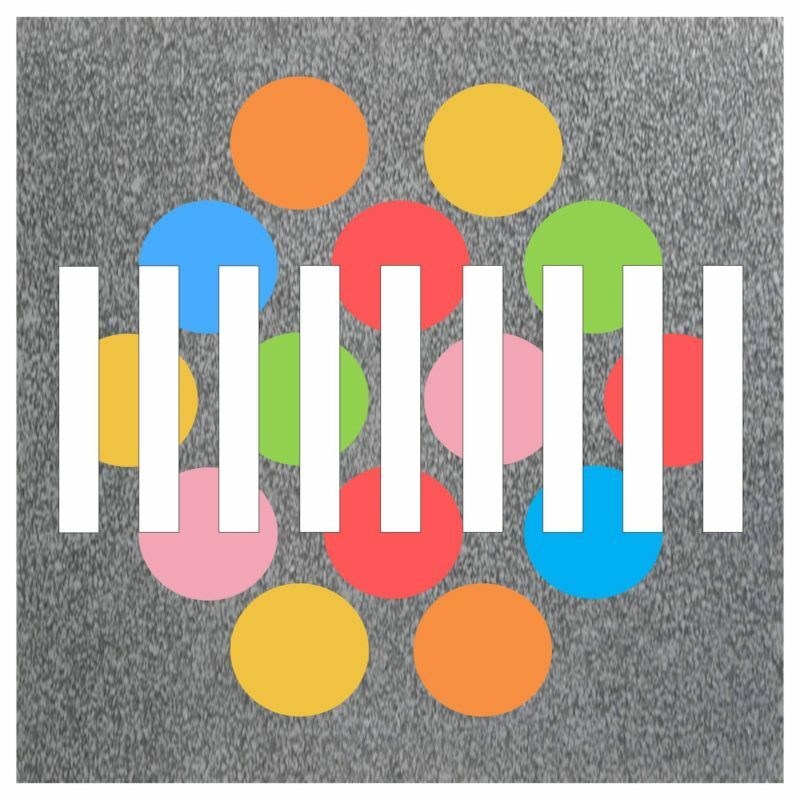 Urban supergraphics | Crosswalk designs feature high chroma colour combinations and designs aimed at attracting attention coupled with Resene FX Nightlight, a glow-in-the-dark white paint that will improve the effectiveness of the pedestrian crossings at night. 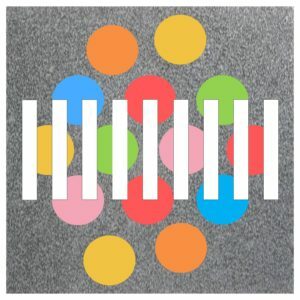 Urban supergraphics | Crosswalk design #1 – Resene colours: Havoc, Bang, Bilbao, Outrageous, Lochmara, Wild Thing, Studio and FX Nightlight. 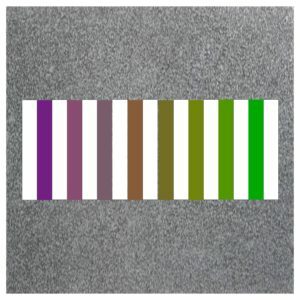 Urban supergraphics | Crosswalk design #2 – Resene colours: Guggenheim, Malibu, Rapture, Supernova, Cupid, Feijoa and FX Nightlight. 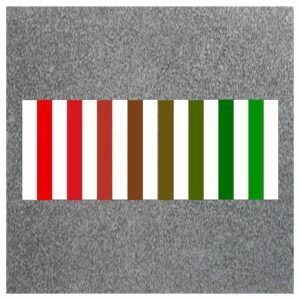 Urban supergraphics | Crosswalk design #3 – Resene colours: Del Toro, Red Red Red, Tall Poppy, Mocha, Horses Neck, Grasshopper, Wasabi, Bilbao and FX Nightlight. 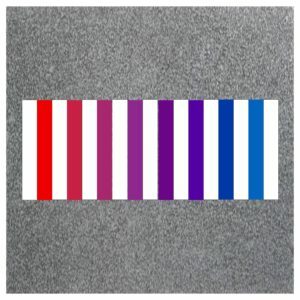 Urban supergraphics | Crosswalk design #4 – Resene colours: Sazerac, Norway, Highland and FX Nightlight. Urban supergraphics | Crosswalk design #5 – Resene colours: Del Toro, Scrumptious, Sassy, Belladonna, Studio, Governor Bay, Lochmara, Curious Blue and FX Nightlight. 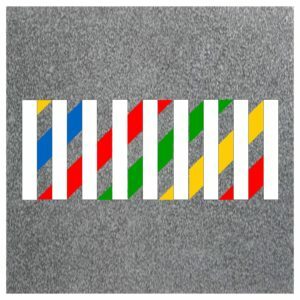 Urban supergraphics | Crosswalk design #6 – Resene colours: Havoc red, Happy yellow, Bilbao green and Curious Blue and FX Nightlight. 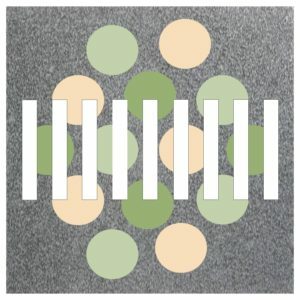 Urban supergraphics | Crosswalk design #7 – Resene colours: Studio, Deluge, Covert, Woodland, Gondwana, Green Leaf, Bilbao, Kermit and FX Nightlight. 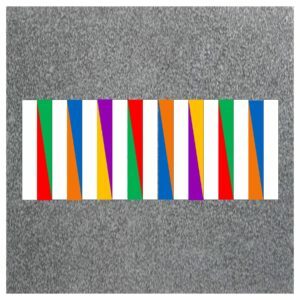 Urban supergraphics | Crosswalk designs by Zena O’Connor, 2018.